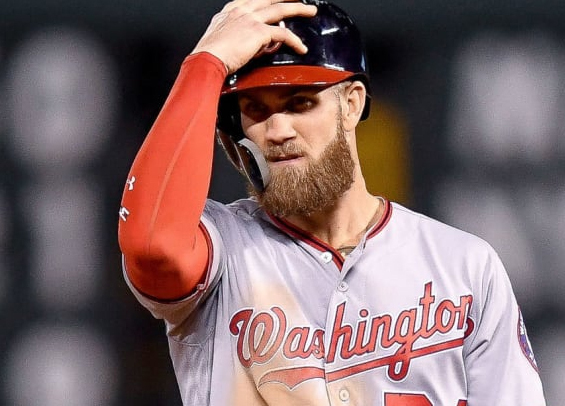 In the seemingly neverending quest for insight regarding the landing spot of megastar Bryce Harper, reports surfaced last night from multiple sources in Las Vegas that prop bets involving the free agent and where he'll sign are no longer playable at several sportsbooks and casinos. Now, this isn't the type of concrete information that fans are hoping for, but it's yet another small sign that the Harper sweepstakes may soon be coming to an end with Philadelphia as the final destination. Adding to the intrigue, makers of the MLB The Show tweeted a teaser on Monday suggesting those interested in seeing where Harper lands should follow their account. Harper is the cover athlete for the videogame. Also on Monday, a picture circulated across Twitter featuring custom bats with some notable Philadelphia flare and Harper's No. 34 made by Victus Sports. Victus, of course, manufactures Harper's bat model. Turns out, per NBC Sports Philadelphia, the bats were being used as a recruitment tool and were not part of an order placed by Harper. Either way, there's plenty of smoke in the Philadelphia air this morning and it means the Harper sweepstakes could finally be coming to an end.